The Hacienda combines the arch and column motif and tile roof of Spanish design with the practicality of a facility that meets the needs of the contemporary equine enthusiast. Actually, the roof is intended to be steel in a tile pattern, but an actual tile could be used. The 1800 square feet of living space on the main level is seperated from the Stable Area by a center garage, with living quarters above, serving as Guest's or Groom's Quarters. The Owner's Quarter's consists of an open floor plan for the Kitchen, Dining and Living area. The Kitchen features an island with eating bar. A central hallway leads past a Laundry Closet to two bedrooms plus a Master Suite, which includes a Walk-in-closet and a 4 piece Master Bath. A Jack and Jill bath services the other two bedrooms. The Garage is designed to accept an 8' wide by 8' high trailer. Wide access is provided to the Stable Area, which includes 4 stalls, a Wash Stall, Tack Room, Laundry Room, Half Bath, Grain and Hay Room, and a Center Aisle. An unlimited number of additional stalls can be added to this design, either enclosed or as run-ins without affecting the balanced frontal appearance of this design. As currently designed, the living quarters above the Garage comprises an eat-in Kitchen, a small sitting area, a Bedroom with a WIC and full bath. Sliding doors off the Bedroom allow access to a Balcony. 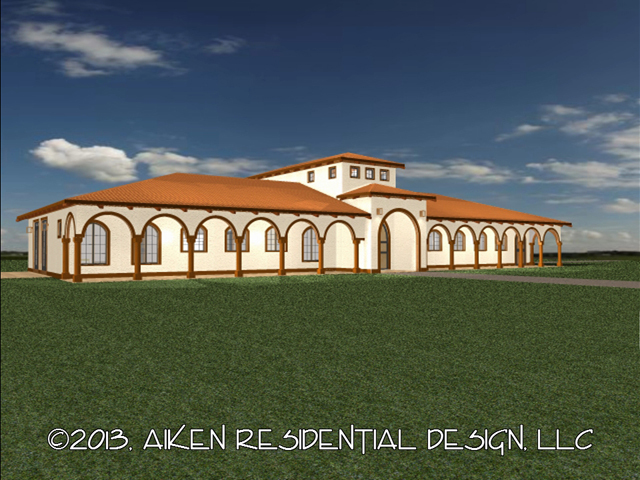 For additional details, contact Karl at (828) 545-8528, or by email at karl@aikenresidentialdesign.com. Here are some additional renderings that show an alternative design. This version adds a second walk-in closet to the Master Bedroom and additional storage area in the Grain and Hay Room. Also, the patios have been enhanced with the addition of a pergola, fire pit and hot tub.